Uranus is searching for models. No, not model cars and airplanes or those crazy Japanese robot things, real models. You know, actual people who like having their picture taken. We’re calling it the Show Uranus Model Search of 2019. We really aren’t calling it that, but we figured if we gave it a name it would be more legit. Regardless, Uranus is seeking people to model our products for our new product pages. We are looking for women and men that want to show off Uranus. If you think you are going to look good showing off apparel, and any other thing we may pull out of Uranus, sign up. As we are a family friendly establishment, this will be a family friendly photo shoot, so no bikinis or speedos, unless you want to send those pics in with your application, in which case we may gladly take them for “administrative” purposes. We’re looking for two photos, one with a full body pose and one featuring your face. Scroll to the bottom of this page and enter your information in the form to be entered. Six people will be chosen (three men and three women) and we will have a public vote on who should be chosen to show off Uranus. The winners will get all kinds a great stuff. If you’re chosen, you’ll receive a bunch of Uranus swag, be featured in our online catalog, websites, social media pages, print products, videos that will be featured on all our platforms including Youtube, participation in a professional photo shoot, catered lunch on photo shoot day, and very special VIP Model party at Uranus’ nightclub, Chicken Bones Party Bar and Grill the night of the photo shoot. Models must be over 21 to participate. We will not take any entries after February 8, 2019. On February 11, 2019, public voting on contestants will begin and will close on February 17th. Winners will be announced on February 20th. Good Luck! But first here’s all the legal mumbo-jumbo…..
Photo Submissions. Photos submitted for consideration will be published on Uranus’s website, uranusmissouri.com, social media pages and accounts, and if a winner, will also potentially be used in promotional material used by Uranus. You must have the rights to use, copy, display, publish, assign and license all of the images that you submit for the Model Search. All rights must be obtained prior to your submitting them for this Model Search. By entering and submitting these photos, You agree that You have the aforementioned rights and grant Uranus the rights to use, copy, display, and publish. You hereby release, discharge, and agree to hold harmless Uranus, his/her heirs, legal representatives, or assigns, and all persons functioning under his/her permission or authority, or those for whom he/she is functioning, from any liability whatsoever in connection with the use of submitted materials, including but not limited to, any claims for libel, slander, right of publicity, invasion of privacy, copyright infringement, unfair competition, endorsement, trademark infringement, or dilution. Any reasonable disputes brought by another party regarding the rights to submitted images will be cause for immediate removal of images from the the Uranus website, social media accounts, etc. and disqualification from the Model Search. Grant of Rights. Uranus shall own the right to use Your name (legal and/or professional), performances, personality, movements, image, picture, likeness, voice, sound effects, endorsement, statements, and approved biographical information in publicity, promotional, editorial, or pictorial materials in connection to this Model Search. Publicity. You may promote, post, and share publicity of this Model Search and your entry on your personal media formats. However, should you make any derogatory, disparaging, or defamatory references to Uranus or this Model Search, You will be immediately disqualified. Any proprietary or other confidential information obtained during your involvement with Uranus, its products, or brand may not be disclosed. No Agency Fees. Uranus shall not be liable for any third-party payments including, without limitation, any brokers’, attorneys’, and/or agents’ fees and/or commissions in connection with Your entry or performance in this Model Search, subsequent photo/ video shoots, personal appearances, and/or the services to be performed and the rights granted hereunder. Uranus Control. Uranus has no obligation to use materials submitted by You or later created by Uranus. You acknowledge the sole right of Uranus to final artistic and business control with respect to Your services and the results and proceeds thereof, including without limitation, the right of Uranus to combine the results and proceeds of Your services hereunder with such other material and to add such special effects as Uranus shall determine. You acknowledge and agree that You shall not have any right of approval or consultation with respect thereto. Notwithstanding any other provision of the T&C Agreement, Uranus shall not be required to actually use Your services or to produce, publish, release, telecast, broadcast or use in any way the results and proceeds of Your services under this T&C Agreement. (c) You have not made, and will not make, any agreement with any third-party which prevents or interferes in any way with the full and complete rendition of the services called for in this T&C Agreement or the exercise of the rights granted to Uranus therein. (e) You have misrepresented yourself in anyway during the application and Model Search process. Indemnity. You shall defend, indemnify, and hold harmless Uranus, its advertising agencies and production companies, and its respective licensees, parent, affiliates, successors, assigns, officers, directors, shareholders, employees, attorneys and agents, from and against any and all claims, damages, liabilities, and penalties (including without limitation, attorneys fees and costs) arising out of or in connection with any breach by You of any warranty, representation, promise, or undertaking made by You under the T&C Agreement. In the event that any legal action or proceeding shall be instituted or that any claim or demand shall be asserted against You or Uranus with respect to which indemnification may be sought hereunder, Uranus shall be entitled to control the litigation and settlement in any such action and that such action is to take place in Missouri. Nothing in the T&C Agreement shall be construed so as to require any illegal act. Any conflict between any provisions thereof and any law or requirement with the force of law shall be restricted to the extent necessary to bring it within the applicable requirements. Any invalid provision(s) shall be severed and of no effect, and the remaining provisions shall continue in full force and effect as if the invalid provision(s) had never been contained herein. Payment of Prize. Should you be selected a winner of the Model Search, You will be notified by Uranus via email and telephone. You must confirm acceptance of this title and the award of subsequent prizes in writing by responding to the Uranus email correspondence informing You that You have been selected as a winner. Uranus shall have no obligations under the T&C Agreement unless and until Uranus has received: (a) fully-executed originals of the T&C Agreement (including, without limitation, this Terms and Conditions Agreement and Model Releases); and (b) such other completed forms or documentation as Uranus shall reasonably require consistent with the T&C Agreement, including, without limitation, documents evidencing proof of age (e.g. birth certificate or driver’s license). You will receive the “gift bag of amazing goodies” within 30 days of the execution date of the aforementioned agreements, forms, and/ or documentation, as well as the scheduled photo shoot. You will be featured in promotional material. For the “photo shoot,” Urans shall not provide travel arrangements and accommodations. You are responsible to be present for the photo shoot or you forfeit all prizes. You agree to provide your modeling and related services for the Uranus Model Winner photo and/ or video shoot(s). You agree to be available on the day prior to the photo and/or video shoot(s) for wardrobe fittings. You agree to be available and perform services for the shoot day(s) as requested by Uranus and at such times and locations as Uranus may determine, subject only to your bona fide professional obligations to third parties pre-existing on the date that Uranus gives you notice of such travel dates. You agree to use your best efforts to arrange your schedule so as to be available as required by Uranus. Should You fail to confirm notification of or refuse to accept the prize/ winning title within 7 days after You are notified that you have been selected as the winner, You forfeit the prize and title and another winner may be selected. No Injunctive Relief. Your sole right as to any breach or alleged breach of the T&C Agreement by Uranus shall be the recovery of monetary damages, if any. In no event may You terminate or rescind the T&C Agreement, any rights granted under the T&C Agreement or obtain injunctive relief to restrain the production, distribution, exhibition, or use of the results and proceeds of Your services or any publications or productions based thereon (or any rights therein) or obtain any other equitable relief. Arbitration. The Parties agree that all disputes, claims, and other matters in controversy arising out of or relating to the T&C Agreement (excluding, with respect to Uranus’ right to seek injunctive relief) shall be submitted to binding arbitration in accordance with the provisions and procedures of this paragraph and all its sub-parts. You waive any right you may have had to file a lawsuit or administrative claim against any shareholder, director, officer, employee, attorney or agent of Uranus for any claim, cause of action, damage, cost or expense arising from, in connection with, or relating to the T&C Agreement. The arbitration provided for in this paragraph shall take place in Pulaski County, Missouri, in accordance with the Rules of the American Arbitration Association (“AAA”). The arbitration shall be held before and decided by a single neutral arbitrator. If the parties cannot agree upon the arbitrator, the arbitrator shall be selected by AAA. The Parties shall mutually agree upon the date and location of the arbitration in Missouri, subject to the availability of the arbitrator. If no agreement can be reached as to the date and location of the arbitration, the arbitrator shall appoint a time and place, except that the arbitrator shall give not less than 30 days notice of the hearing unless the parties mutually agree to shortened time for such notice. Entire Agreement. The T&C Agreement constitutes the entire agreement between the parties with respect to the within subject matter, and no waiver, modification, or addition to the T&C Agreement shall be valid unless in writing and signed by the parties hereto. The T&C Agreement shall supersede any and all prior or contemporaneous agreements between the parties hereto. Term. The term of this letter agreement shall begin on the date that it is fully-executed and shall end 2 years after. 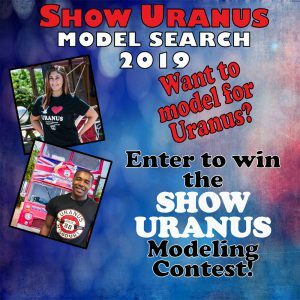 By submitting Your entry into the 2018 Uranus Model Search, you hereby agree to the terms and conditions contained in this Terms & Conditions Agreement. Finally… Now you can enter the contest! Click this link and fill out the form to enter. Don’t forget to have two photos of you handy to upload with your entry form!